to start using all advantages of this service. 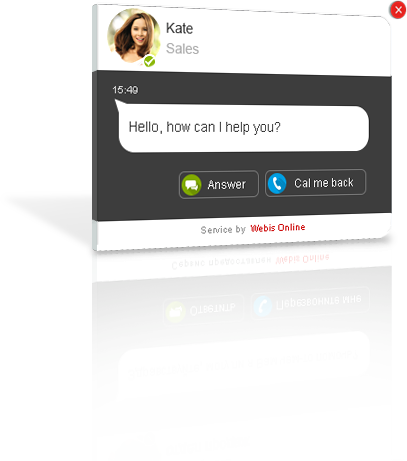 Get instantly connected to your clients: web chat allows to achieve the fastest contact. This will make your clients even happier. 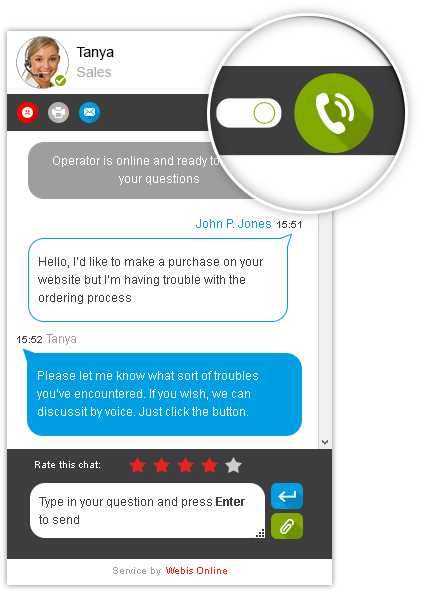 Communicate with your clients by voice without using a telephone: easy and quick voice calls are integrated into the web chat window on your website. WebisOnline widget will perfectly fit your website look thanks to a vast variety of design themes and customization options. And our sound quality is unbeatably excellent! Advanced statistics system and stored chat logs will allow you to appraise your managers efficiency and optimize your business processes. 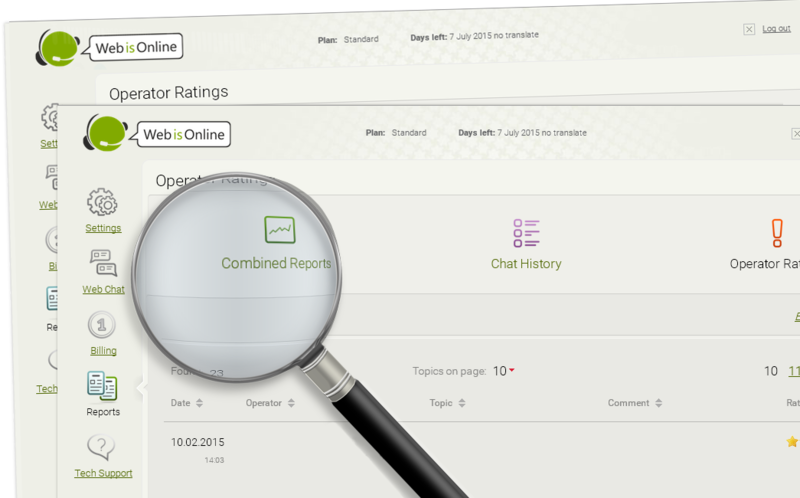 Monitor your operators response timings, chat logs, ratings and feedback from visitors. We have all seen those “request a call back” forms of various kinds on many websites. They get your information sent to managers via email. WebisOnline further advances this feature: no more fear of loss of your clients’ data. No more need to have several forms on your website: all essential features for setting up a clients feedback line and collecting leads are now united in a rich and convenient service. Optimize and organize work process of your online specialists: let the client choose where to address his request. Even if he chooses wrong, the operator will be able to redirect the request to the designated specialist. Whenever you need to quickly send some price list or submission form to the client, you can do it without leaving your chat window. The client will get your files instantly. He will also be able to download the file again later if he needs to. Same for the clients: they can send you required files at once. If your client looks aside from chatting with you, you will not lose him. When he re-visits your website, WebisOnline remembers him and loads his full chat history. The client can request WebisOnline to send the chat log to his email address. The chat log will list all actions, messages and files. The operator also has access to chat logs in his personal area. Would you like to attract more smartphone users? WebisOnline works perfectly on all modern mobile platforms, its smartphone interface is specially optimized for smooth work. Enable SSL support in your WebisOnline client area and safely exchange sensitive information.